Students may place online orders through the University's approved textbook vendor, Barnes & Noble, by visiting the Find Course Materials page. Students may also visit Georgetown's Main Campus bookstore located in the Leavey Center on Main Campus. Students must load money on their GOCards and then swipe their GOCards on the Xerox machine in order to copy or print. Students can load money online or at the GOCard machine in the main lobby on Level 1. The Xerox machine requires faculty to input their accounting code in order to copy or print. Each program has a unique accounting code; please contact your program manager or director to receive your code. 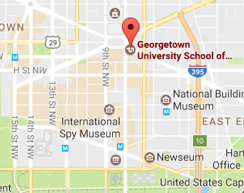 All SCS credit (degree) program students, faculty and staff must have a valid GOCard (“Georgetown One Card”) to gain entry into 640 Massachusetts Ave. Students, faculty and staff swipe their GOCard each time they enter the building. GOCards also store money for copy and print services (visit the GOCard website to add money to your card). Note: Noncredit program students do not receive GOCards. The SCS GOCard Office is full-service and processes GOCards for SCS students, faculty and staff. If you need a new GOCard, or need to replace a lost or stolen GOCard, the SCS GOCard office can take your picture and print your card on the spot. Lockers are available to SCS students, faculty and staff, free of charge. Please sign-in at the reception desk in the main lobby on Level 1 to receive your locker assignment and key. Lockers are assigned on a first-come, first-served basis. In order to reserve a locker, users will be required to leave a photo ID with the reception desk. The ID will be given back upon the return of locker key. Lockers are available for day use only. Users must remove their items and return the key to the reception desk before campus closes every evening. IDs will be securely stored at the reception desk in the main lobby on Level 1 until the key has been returned. Georgetown University and the School of Continuing Studies are not responsible for lost or stolen items. Violation of locker policies will result in loss of locker privileges. SCS Lost and Found is located at the reception desk in the main lobby on Level 1 at 640 Mass Ave. Lost items are collected and logged daily and will be held for 30 days. After 30 days, items are donated to Goodwill. A quiet study room is available to students and faculty and is open during building operating hours. No food or drink is allowed (except water), all mobile devices must be silenced and there is no talking permitted. If you listen to music, please be considerate of others and adjust your headphone volume accordingly. A private wellness room is available to students, faculty and staff who seek respite. The room is equipped with a couch, refrigerator and sink and is suited for nursing mothers and those who are not feeling well. Please sign-in at the reception desk in the main lobby on Level 1 to receive the key to the room (there is a $10 fee for an unreturned or lost key). SCS's in-house café serves Starbucks brewed coffee, Frappuccinos, espresso, Tazo tea, and other specialty drinks; make-your-own frozen yogurt; bagels, pastries, muffins, cupcakes, and other baked goods; prepared sandwiches, salads, soups, and yogurts; chips, nuts, candy bars, and other snacks; and bottled sodas, teas, water, energy drinks, and juices. Hours: Monday–Friday, 11:00 a.m.–9:00 p.m.